While I despised my time at Ralphs, I must admit that some of their perks were slightly worth the trouble. Slightly. The major one, of course, was health benefits for myself and Anthony that set me back maybe $7 every week. If I had hung around there long enough to add Ann then they would have gone up to $15 per week. Definitely not a bad cost. Another equated to cash back for every dollar we spent at the store. At the end of every quarter, I would get a certificate for whatever that amount was. In some cases, it was as high as $80 which could be used on anything in the store. Then there were the other perks like getting a discount on cell phone plans which, after thinking about it, wasn’t all that spectacular even with the discount. We made the move to AT&T a few months after my start date and were with them ever since but now that I’ve parted ways with Ralphs (or vice-versa it seems), it won’t be long before American Telephone and Telegraph gets word of it and I lose my discount. I don’t even want to know what my bill would be then. So we had to make a move and that move was going with Sprint’s “Cut Your Bill In Half” plan. It’s definitely a deceptive title all things considered since it only cuts the data portion of your bill in half so don’t expect your $150 bill to be $75 because it won’t. Granted, we are now paying less than we were with AT&T and with insurance on all three lines but as for cutting our bill in half? Oh no. It’s far, far, far from it. As a stipulation of the plan, we had to get all new phones which was no big deal for Ann and Anthony. They chose the iPhone 6 without hesitation. They knew what they wanted. It needs a lot of storage and expandable memory. Must be small enough for an armband when I go running. A good camera would be nice. Stylish would be okay, too. I’d like a nice display as well. So as the paperwork was being filled out, I made my way around the store looking at a variety of Android phones because that’s all I’ve owned since first getting a smartphone – and I wasn’t about to change that. There was too much I enjoyed about Android, namely complete customization: launchers, the ability to make (free) ringtones from any .mp3 on the phone, widgets, and the fact that it could be treated like a hard drive which made transferring data a breeze. Then there was the iPhone. I never liked them because everybody had one and their stigma of “sheeple” customers always bothered me. I didn’t like Apple’s proprietary nonsense with cables. I didn’t like that memory could not be expanded. I didn’t like the way Apple controls just about everything on the phone via iTunes. I didn’t like the fact that you couldn’t add widgets to the screen (I’m a big widget fan). I didn’t like much about iPhones even if I had owned and still own a few iPods. Plus, the absence of a Back and Menu button was also a big turn-off. How can I get anything done with one button? There was no way I could get used to this kind of thing even if I had an iPod touch in the past. Besides, they were always too expensive for me. But as I made my way around the store looking at different Android models, I discovered that no matter which one I chose, it was just the same experience I’ve had on my previous models only in a different skin. Same turkey, different bread only now the turkey was starting to get a little ripe. And I didn’t want to eat bad turkey for the next two years. The LG G4, Samsung Galaxy Note 4, and even the HTC one M9 (I was using an M7 at the time) weren’t offering anything special. Most had limitations in terms of storage or some other thing I just didn’t like, so I continued my browsing. This was the worse case of beslutfattande* I’d ever had. And the family had grown weary with all of this, especially Anthony who had to give up his phone and lose all of his Minecraft progress. He was not happy about that. But I still couldn’t decide and continued to make the rounds in the store. Then it happened. I threw my hands up. I gave in and pointed to the 64GB iPhone 6. “Oh, just give me that one,” I said to Ann. Both she and Anthony were pretty shocked at my decision with Anthony asking if I was okay. He knows I loved my Android phones and was always talking smack about iPhones and their limitations. But I didn’t have anything to lose in choosing the iPhone because I could bring it back in 14 days if I didn’t like it. I was so certain that I’d despise the thing that I told the girl at Sprint that I’d see her in a few days. Well, it’s been a few days and I still have my iPhone. Do I like it? Let’s go over all the things I thought I’d miss. Widgets: A widget is a live, quick-reference app that can be installed on any of your screens. It’s great for things like weather conditions, sports scores, etc. and they are one of the things that separated Android from Apple. But do I miss them on my Home screen? Nope. Not at all. They were a convenience but definitely not a necessity. Free Ringtones: Android phones allow you to assign any .mp3 file as a Default or Contact ringtone. All you have to do is point to it and it will play that song as you assigned it. Apple charges for their ringtones through iTunes which kind of annoyed me considering I’ve already paid for my music. However, I found an app that allows you to create your own ringtones from songs in your iPhone’s music library. It’s a little tricky and still involves using iTunes to get them on your phone but it works. Solved that problem. One Button vs. Several: Having one button isn’t as bad as I thought it would be and I’m getting used to navigating my way around the phone with only one physical button. Naturally there’s a learning curve but being I had an iPod touch, there wasn’t much to learn. I guess just the thought of having only a Home button on a device I’d use more frequently than my iPod bothered me but no, it really doesn’t now that I’m doing it. Expandable Storage: As of this post, I have over 2,600 songs, 9 videos, 49 apps, and a whole bunch of pictures on my 64GB iPhone. I’d say that what I have on it is pretty substantial and it gets me by. All of this and I still have over 33GB left. I don’t think I’ll have a problem with storage even if I add more music to it. So that covers everything that made me so hesitant about the iPhone. What about the rest of it? Size: I wouldn’t say it’s perfect because nothing really is but I will say that it’s amazing how much technology got crammed into something so thin. Even with a case on it, the iPhone still sports a very thin profile and I like that. It fits right in my pocket and armband for running, but sometimes almost seems a little too thin. Display: It’s crisp and clear, and the camera seems to produce decent quality pictures but I have yet to shoot videos with it. Performance: This pretty much seals the deal. With any of my Android phones, it wasn’t uncommon to get the “Unfortunately, [app name] has stopped running” warning telling you that something went funky. But I suppose this is what happens when the phone is basically a computer and treated as such: things break. With Apple having a little more control over their iOS, it seems they’ve gotten a better grip on things like this. No, I can’t say that this will never happen with an iOS device because there are some apps that crash on my iPad but not as often as they have with any Android device. The iPhone’s performance is nowhere near anything I’ve had in the past: it’s fast and fluid, and blows all of my other phones out of the water. And oh, I can find cases for it anywhere — even at the dollar store. And as an added bonus, my Pebble watch works perfectly with the phone. It was kind of glitchy with my HTC one M7 and would sometimes reset but I have yet to experience that with the iPhone. The only thing about the Pebble that’s disappointing is the lack of apps for customization, i.e. 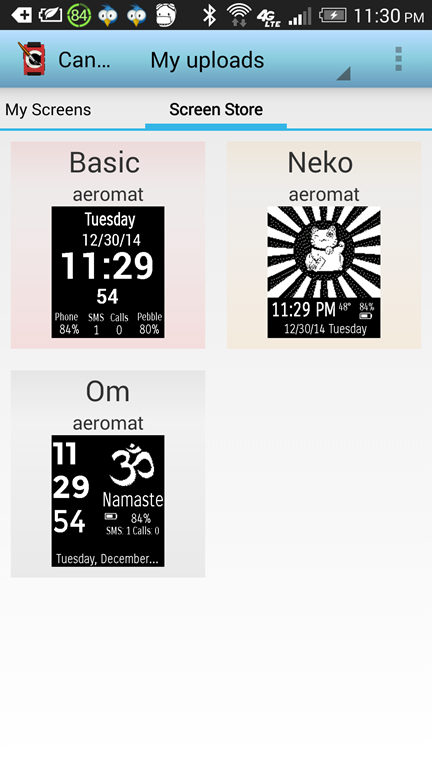 ones that allow you to make watchfaces or reply to messages. There are none for the iPhone so that’s definitely a setback. My earbuds also fall the under It Just Works category. Botton was response very with my unpredictable Android but not so with the iPhone. The Verdict: I have to admit that despite my initial trepidation, I am beyond satisfied with the iPhone 6. Not only is it a great device but it’s also an entirely new experience for me and change is most definitely a good thing. The people at Sprint won’t have to worry about seeing me within the next 12 days with phone in hand, ready to return it to them in exchange for a Samsung or LG. But with Apple reportedly announcing new models in a few weeks and our contract being a part of the iPhone Forever plan, I will most definitely be paying them a visit to upgrade to the newest model once it is available. But I’m not camping outside the store for it. That’s just goofy. *Beslutfattande: Swedish for “decision making.” This is what I got from proofreading several languages in the past.